In our last lesson we learned that Jesus Christ rose from the dead to become the Head of a new family—the children of God. By natural birth we are all in Adam's family. To become a member of God's family, we must be born again spiritually. In this lesson we will learn what it means to repent. Repentance is a "turn-around"—a change of direction. The reason we need to turn around is that we have been going the wrong way. We have been going our own way—leaving God out of our life. Jesus told us that there are two roads in life, a broad road and a narrow road. He told us where each of these roads leads. 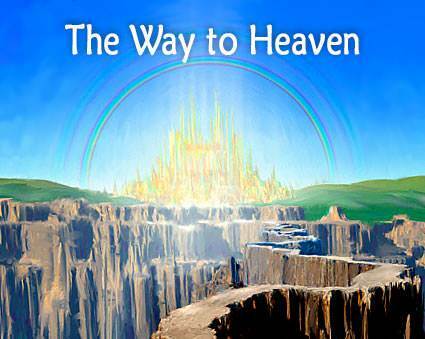 The broad road leads to "destruction"—hell; the narrow road leads to "life"—everlasting life in Heaven. It is a "turn-around"— a change of mind about ourselves and about God. We have all sinned. We are all sinners. We may not like this description of ourselves, but it is true. The first step toward being saved is to realize this. A famous astronomer was conducting a number of young students around the observatory. 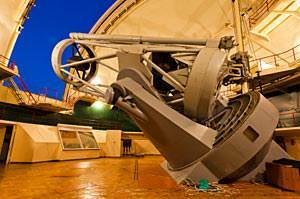 He showed them the giant telescope that scans the heavens revealing planets and objects unseen by the naked eye. With great eagerness, one young student asked the astronomer if he would tell them, out of all the years he had been studying the heavens, what was the greatest discovery he had ever made. 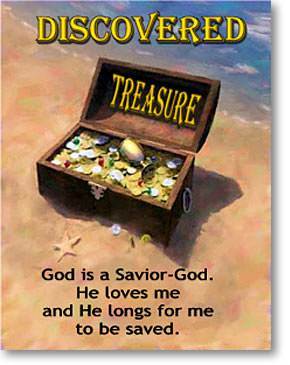 The man replied, "If you would really like to know the greatest discovery that I have ever made, I will tell you, and that is that I was a sinner and that Jesus died to save me." Friend, have you made this discovery? No one is ever saved until he sees that he is a sinner in need of a Savior. You may be decent and moral in your life, fair and upright in your dealings with your fellow man, a good husband or a good wife, a kind and generous person, but you have left God out of your life. You are yet unsaved. You may be an active church member, a liberal giver to charitable and religious causes, and, at the same time, you have never come as a lost sinner to Jesus and trusted Him as your Savior. Dear friend, do not let your pride keep you from admitting that you are a sinner. You must see that you are a sinner in order to be saved. 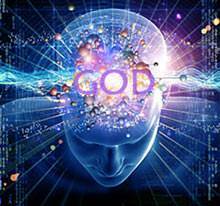 Before a person is saved, he has all sorts of wrong ideas about God in his mind, put there by Satan. Jesus came to tell us and to show us what God is really like. 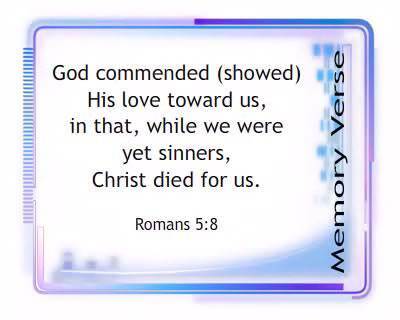 He showed us that God loves sinners and that He wants to save them. In Luke, Chapter 15, Jesus told of a shepherd who had a hundred sheep. One day, as he counted his sheep, he discovered that one of them was missing. What did the shepherd do? He left the ninety-nine and went out into the wilderness to search for the lost sheep. When he found it, he returned rejoicing, with the lost sheep on his shoulders. He gathered his friends and said, "Rejoice with me for I have found my sheep which was lost." Whose loss was it? 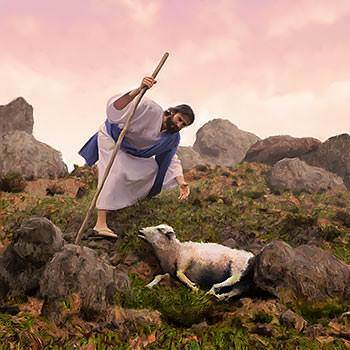 It was the shepherd's loss, and he could not rest until he had found his lost sheep and brought it back to safety. 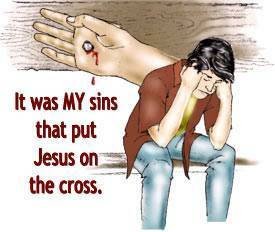 It was MY sins that put Jesus on the cross. 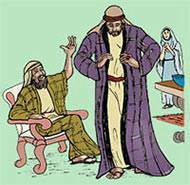 Jesus told another story about a father with two sons. This is known as the Parable of the Prodigal Son. Let us read this beautiful story as it is told in the Bible. Then Jesus said, “A man had two sons. The younger of them said to his father, ‘Father, give me the share of the estate that will belong to me.’ So he divided his assets between them. After a few days, the younger son gathered together all he had and left on a journey to a distant country, and there he squandered his wealth with a wild lifestyle. 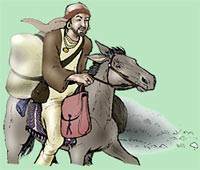 "Then after he had spent everything, a severe famine took place in that country, and he began to be in need. So he went and worked for one of the citizens of that country, who sent him to his fields to feed pigs. "So he got up and went to his father. But while he was still a long way from home his father saw him, and his heart went out to him; he ran and hugged his son and kissed him. So they began to celebrate." Whose loss was it? It was the father's loss. The father could not bear to lose his son. Dear friend, if you have not trusted Jesus as your Savior, you are lost. Whose loss is it? It is God's loss. But God cannot bear to lose you. He loves you with an everlasting love. You may die unsaved, but you will not die unloved. God is a Savior-God. He wants to save you. God has shown His great love for you. He has even given His Son to die, to bring you back to Himself. But you must see your need and turn to Him. God says to us, "If only you will recognize that you are a sinner and in need of a Savior, I can help you." Repentance can take place in a moment of time. When you say, "God, I see that I have been wrong. I have been going my own way. I am turning to You now. I do need Christ as my Savior"—this is repentance. This will bring joy to God's heart. Will you turn to Him now?